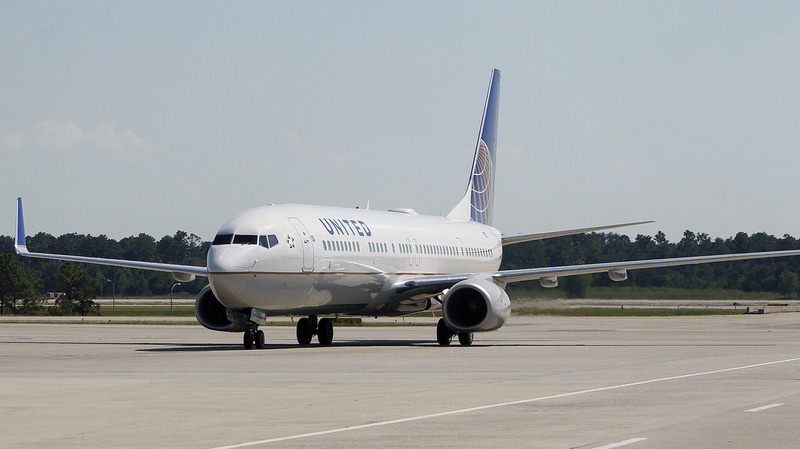 Dog Dies In Overhead Bin On United Flight; Airline Apologizes : The Two-Way The incident prompted shock, outrage and sadness, particularly after it emerged that a flight attendant had required a family to put their young dog in the overhead bin for a three-hour flight. A dog died aboard a United Airlines flight from Houston to New York's LaGuardia airport, prompting questions and outrage. A family that flew on United Airlines Monday night is mourning their dog, after the pet died in an overhead bin — an arrangement that a flight attendant had reportedly insisted upon. United says it was "a tragic accident" and that it is investigating. The incident prompted shock, outrage and sadness, particularly after it emerged that a flight attendant had required the dog, a 10-month-old French bulldog, to be placed into the overhead bin, despite the family having followed all the rules about flying with a pet in an airliner's cabin — including using a TSA-approved pet carrier. "Why would the flight attendant force the woman to put her dog there?" wrote passenger Maggie Gremminger, in a tweet. Gremminger, who had been seated near the family, added, "I could have done something. I'm so upset." The dog had been traveling with a woman who also had her young baby and her older daughter on the flight with her. The animal died during the more than three-hour trip. Since then, the airline has agreed that the situation never should have unfolded the way it did. The family was on United Flight 1284, from Houston to New York's LaGuardia airport. Their flight Monday night lasted 3 hours and 25 minutes, according to an online tracking site. And while passengers said they had heard barking during the trip, the dog's owners realized the dog had died after retrieving the travel carrier from the bin. "I just flew into LGA and witnessed a United flight attendant instruct a passenger to put her dog bag in the overhead bin. It was clearly a dog and while the customer was adamant about leaving it under the seat, the attendant pushed her to do so," Gremminger wrote on Twitter. "Myself and a fellow passenger felt like that was NOT a thing. I am not a flight attendant tho. Maybe they have air ventilation in there that I didn't know about. I tried googling rules about pets on board but didn't have ample time before [takeoff]." "At the end of the flight, the woman found her dog, deceased. She sat in the airplane aisle on the floor crying, and all of surrounding passengers were utterly stunned." "I am disgusted and traumatized," Gremminger said via Twitter. "Pets are family. How could a trained flight attendant instruct a passenger to place her dog in that bin. It was her job to understand the plane and it's rules/limitations." The plane landed a little before 11 p.m. — but Gremminger said the experience left her unable to sleep. She began sharing the story on Twitter, including a photo of the family who lost their dog. From there, both interest and disbelief snowballed online, along with anger. Gremminger says it all became a blur, as she fielded questions and spread the story. Gremminger spoke to numerous media outlets on Tuesday, from NBC and CBS to People magazine and Fox News. It's the latest black eye for United, which has endured a string of recent public relations nightmares, from a passenger being dragged off a flight to another case of a dog dying after a United domestic flight one year ago — in that case, the large animal had flown in a crate in a plane's hold, and was under the care of United's PetSafe program. United says its policies allow for dogs, cats and some types of pet birds (no cockatoos are allowed) to travel in its planes' cabins. If a passenger brings a pet carrier in addition to a carry-on bag, they must pay an extra $125. "A pet traveling in cabin must be carried in an approved hard-sided or soft-sided kennel," United's policy on animals reads. "The kennel must fit completely under the seat in front of the customer and remain there at all times." The airline adds that soft-sided kennels, like the type used by the family on Monday night's flight, can be slightly larger because they're able to be compressed without becoming an obstruction. Gremminger issued a final tweet on Tuesday, saying "the past 24 hours have been insane." "My hope was to gain some media attention so that we can collectively raise our awareness about pet safety + travel." Thanking those who have helped to spread and amplify the story, Gremminger said she hoped that a "day of shouting to media outlets" will help prevent similar tragedies from happening. "Everyone loves dogs," she wrote. "Everyone wanted to hug that family who lost their dog last night. Everyone cares."